ON SALE NOW! 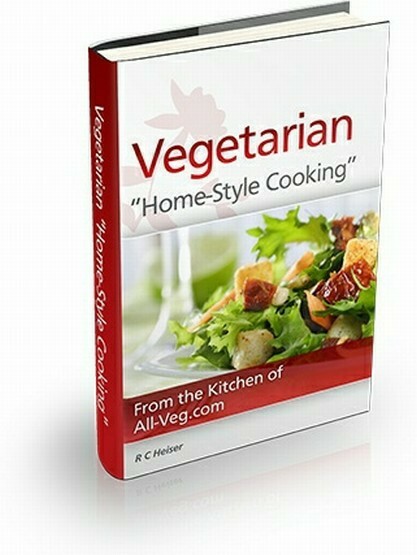 We're taking $5 off the list price of the All-Veg eCookbook! Now ONLY $11.97! Hi folks! I was just looking at several recipe books for sale online. Some of them had as few as 12 to 15 recipes and sold for $10! The All-Veg cookbook has 130 pages with more than 60 great recipes! So...we're having a sale. Buy the All-Veg cookbook and get $5 off the list price! Not a bad deal...and the donations are still being made to the organizations mentioned below. Our eCookbook is LOV Vegetarian but there are plenty of vegan recipes and all LOV recipes are easily adaptable. This e-book is a convenient way for you to keep and find some of our favorite recipes. The book is a compilation of our favorites from our website as well as new recipes you won't find online! Why an e-book? Easy! E-books are great because they don't take up valuable space on your counter or in your bookcase. You can save it to your desktop and click it open anytime you want to get one of our great recipes. They are also more eco-friendly! Print off only what you want to use, when you want to use it. Or, if you keep a laptop handy, take it right to the kitchen and open it to the recipe you want to use. Save a tree! Right now you can get your copy of the All-Veg eCookbook by simply clicking the button below. It will be delivered to your inbox in minutes! What will you find inside? There are more than 125 pages of terrific recipes, photos, cooking tips and handy tools that every kitchen should have. Your purchase of the All-Veg cookbook serves a couple of important purposes. It helps mitigate the costs of keeping All-Veg online so we can continue to bring you excellent recipes and informative articles. So treat yourself or a friend to a great cookbook and help us help them! Thank you for your support! But wait - there's more! NO EXTRA CHARGE! 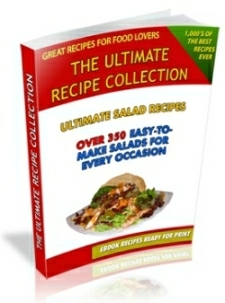 Buy our cookbook and we'll also include The Ultimate Salad Recipe Collection. The Ultimate Salad Recipe Collection isn't all vegetarian or vegan (though we wish it were) - but with more than 300 delicious salad recipes, we promise you will have plenty from which to choose! These salads run from the simple to the simply divine! Make any dinner party, holiday get-together or family dinner a healthy feast with a wonderful green salad, a delicious fruit salad - a cold or warm salad...almost any kind of salad you can think of is in this e-book! But best of all...you get it FREE just for buying our cookbook! So grab your copy NOW - TWO TERRIFIC e-BOOKS FOR THE PRICE OF ONE! Please note that the e-books you are about to purchase are Adobe PDF format e-books. If you don't have Adobe Reader you can click here to install it for free!